We see BAMBOO PRODUCTS everywhere these days. 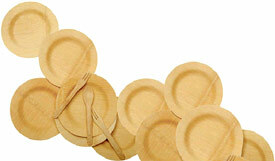 Single-use bamboo plates and serverware is a great way to replace disposable paper plates towards eco friendly use. They can be used for home, picnics, celebration parties, weddings, catered events, offices, or any other occasion where disposal paper or plastic dishes are utilized. Look for companies that manufacture a collection from sustainable bamboo online, and your grocery and cooking products stores. What’s great about these products is that although they’re meant to be for single use, there is nothing preventing repeat use. Just wash with an eco friendly dish soap that’s biodegradable, which you can extend by adding water to the bottle when it’s half full. Use bamboo plates for children’s arts and crafts or your home art collection. I know someone who loved the look of bamboo so much they created a huge “found object” wall collage for their living room and a smaller one for their kitchen that was cost effective art, and a great design feature. There are so many beautiful bamboo products today to enjoy. Make at least one part of them part of your household choice to assist sustainable growth towards preserving our environment.